The Short and the Sweet of It: Bathroom Love. Matt and I recently had a funny discussion. Well there is much comical banter in our house, but this one revolved around our fictional house that we do not own yet. 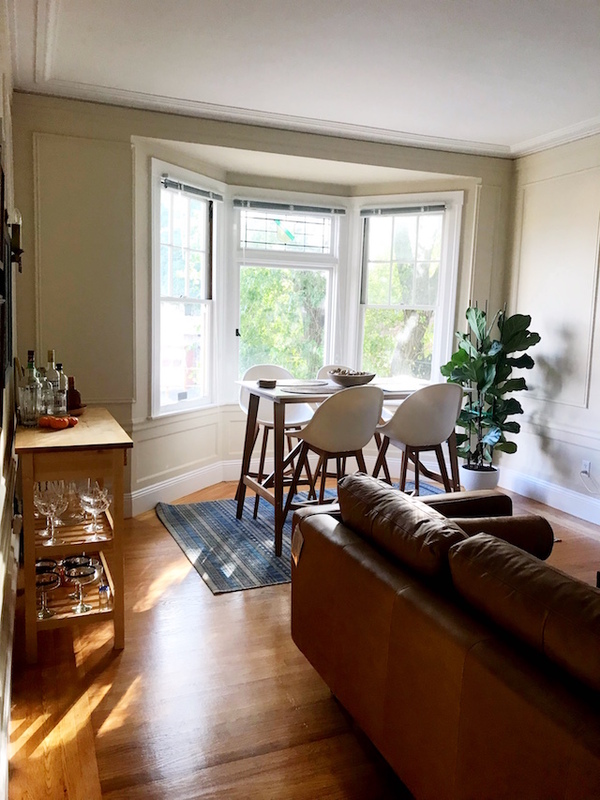 I commented that I liked yellow and white for the kitchen and Matt sort of grumbled about it (I think it's too cheery for him). He was very gracious however and said I could "have" the kitchen if he could decorate the bathrooms. I think that's a fair exchange. 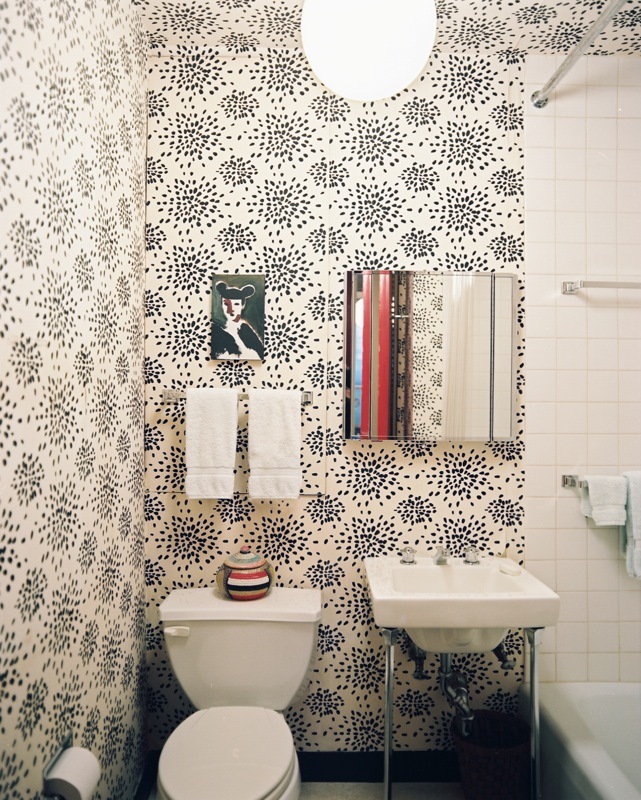 I've never been too into decorating our bathrooms...but these ones have me swooning. I'm sure Matt likes none of them. P.S. He just looked at my choices (I was correct. He said the third "might work"). really like this post, very inspirational ! I really like like the bright coloured towels in the third picture ! I loooove the last image with the amazing wall paper! I'm moving into a house next week and this definitely gives me inspiration. Love the subway tiles in #1 and love the symmetry and simple feel of #3!! That first bathroom is to die for! 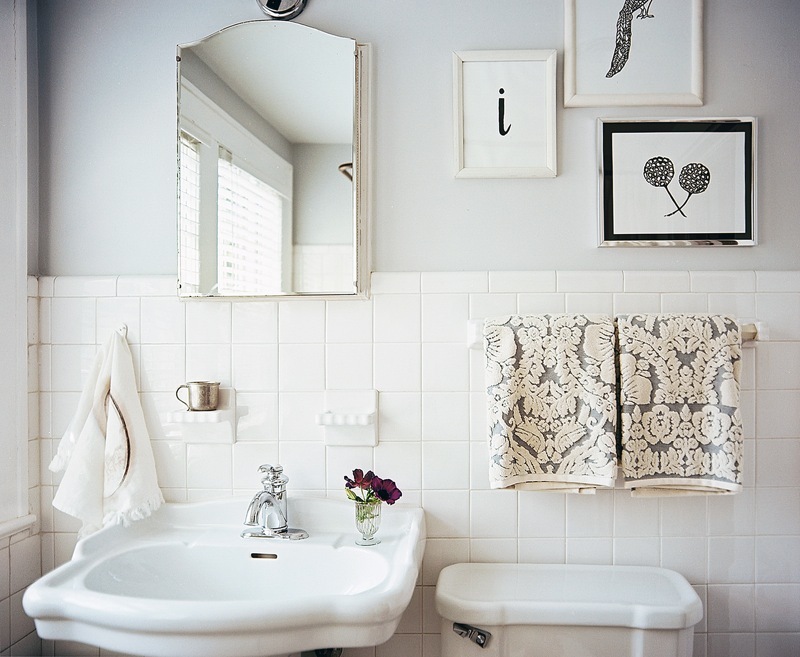 I love the black paneled tub and frames! well the 3rd one is pretty so that's good at least! I'm glad you guys agree. Haha. 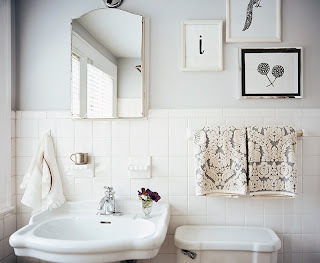 I love seeing framed photos in the bathroom, it looks so sophisticated and home-y! Loving all of these bathrooms...such an often forgotten space! Okay this conversation is just hilarious because it could totally be a convo between me and the hubbs...of course, I would never concede to him decorating *anything* by himself...nor would he volunteer!! ha! I would love a claw foot tub! That 3rd one is nice. The bathroom is the man's fortress. haha I would MUCH rather have the kitchen anyways :) Can't wait to see how he decorates it. Spill the deets when it's updated! I want to see! So so pretty! I love subway tiles in bathrooms. I love the first bathroom and third one is pretty adorable, too! I would agree to any of them-they're wonderful! I'm also glad to hear that someone else talks about their fictional house-John and I do it all the time!